Wednesday morning, the City of Greenville was the recipient of two grants and a vehicle from Ameren Illinois. 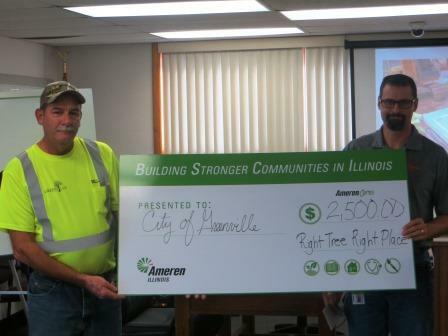 During a ceremony held at the municipal building, Ameren Illinois officials awarded Greenville $2,500 as part of the company’s Right Tree program, and Ameren Illinois designated Greenville as a Progressive City and gave $2,500 to be used for a community-related project. At the end of the ceremony, Ameren Illinois turned over to the city a 2006 truck with a 41-foot aerial bucket. 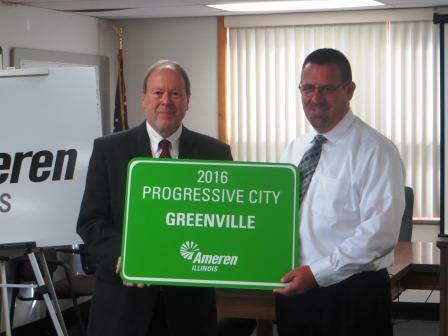 Greenville Mayor Alan Gaffner expressed appreciation for the Ameren grants and the truck. He commented about how the city plans to use the Right Tree grant. Jason Klein, director of division operations in the Greenville area talked about how Greenville was selected with the Progressive City designation. An Ameren Illinois spokesman told WGEL it is very unusual for one city to receive both grants in the same year.